East Timor (or Timor-Leste) is a small country located in Southeast Asia, formerly a part of Indonesia, which consists of several small islands, the Eastern half of the Timor island and a small enclave on the Western side, which belongs to Indonesia. It gained independence in May 2002, after a bloody conflict with Indonesia that lasted for decades. East Timor used to be a colony of Portugal and is the only predominantly Roman Catholic country in Asia besides the Philippines. 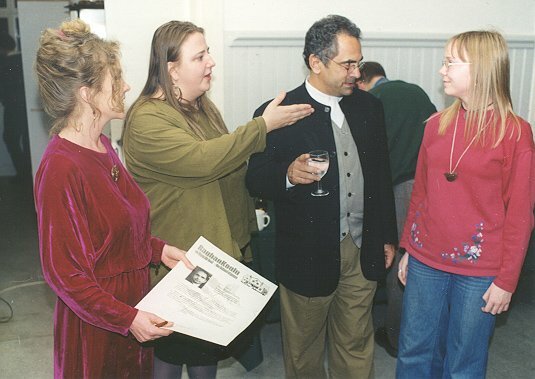 As a curiosity, I have met Nobel Peace Prize laureate José Ramos-Horta who was the president of East Timor until this May (see the photo!) back in 1998. As could be expected, the East Timorese cuisine has been influenced by neighbouring countries, especially Indonesia, but also Portugal, including feijoada. a pork and bean dish which is also eaten in former colonies of Portugal in South America. Fish is popular, as in most island nations. Mung beans and other legumes are also used a lot. Most food is quite spicy, often flavored with e.g. tamarind, chili, coconut, garlic, lemongrass, thai basil, lime leaves and mint. Corn and to some extent rice and some starchy root vegetables are the staple starches, but poorer people also eat akar, a jelly made out of dried and ground palm tree bark. Water spinach, also known as e.g. Chinese spinach, morning glory and kang kong, is a popular green vegetable in many Asian countries and can be found fresh in many Asian grocery stores. It is sold in large bunches, which make one think of bamboo, with their narrow leaves and relatively thick stems. I wasn’t sure whether the stems should be used too, but the Internet advised me that the leaves should be stripped out and the stems cut into pieces. I left out the thickest stems because it seemed like they might end up too chewy. 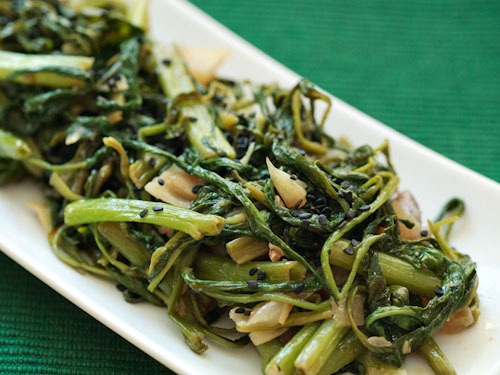 In this recipe the water spinach is served with quite typical Southeast Asian spices. The water spinach isn’t all that different from spinach or other non-bitter greens, IMO. The spices are good, but water spinach is quite a bit more expensive than spinach, so I’m not sure if it’s worth buying it. I would almost suggest using a mixture of spinach and steamed, chopped green beans (to emulate the stems). I wasn’t sure whether the sesame oil refered to toasted or untoasted, so I used some toasted sesame oil and some olive oil. Wash the water spinach and prepare it as in the instructions above. Heat the sesame oil over medium-high heat. Add onion, garlic and ginger. Stir-fry for a minute or so until the onion begins to turn translucent. Add the water spinach, chili, water and soy sauce. Continue to stir-fry just until the water spinach wilts, about another minute. Garnish with sesame seeds and/or Thai basil leaves. Serve hot as a side dish. Serves 3. This entry was written on July 11th, 2012 by Maija Haavisto and filed under Asia, Side dishes.